The CSVI Field Mapper helps you to map your fields against CSVI fields. One of the most daunting tasks you have to deal with when setting up a new import is to match your own fields with the CSVI fields. To give you a hand, the CSVI Field Mapper has been created. What is the Field Mapper? CSVI Field Mapper is a tool to help you create your template with the correct CSVI fields. The field mapper is located under Templates. How does the Field Mapper work? When you are done with the mapping of the fields, you can create a template of this by clicking on the Create Template link. Don't upload your full file if it is a large file. We are only using the first line of the file. CSVI will try to detect the delimiters used in your CSV file. In case this doesn't work correctly, you can set this to No and specify your own delimiters. 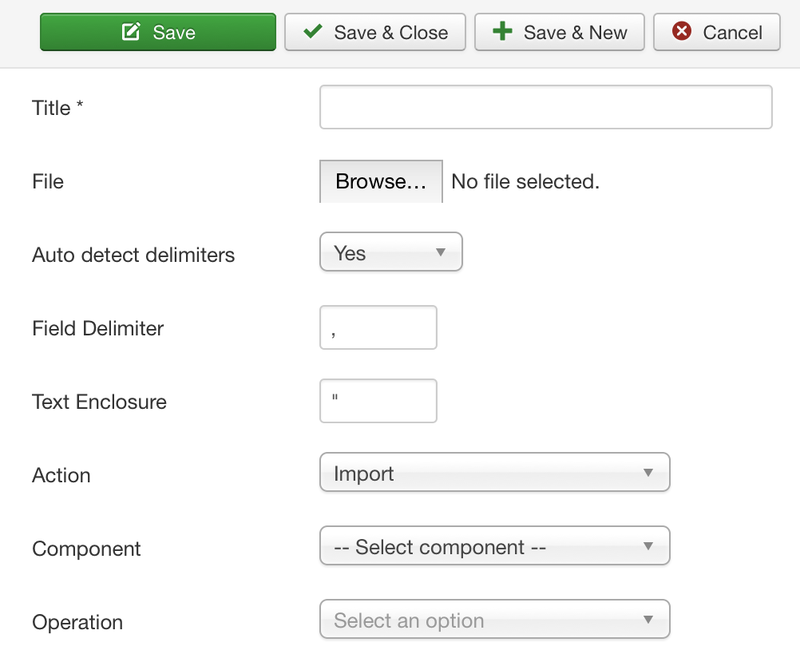 The field delimiter is the character that separates the fields in your CSV file. The text enclosure is the character that surrounds each field. Select whether you want to do an import or export. Select for which component you want to do the import/export. Select what kind of operation you want to perform. After these fields are filled out, click on Save. This will create the field map and process your file. After the field map has been saved you can see a table like the screenshot. On the left you see the field names from your file and on the right the available field names of CSVI. CSVI does not match the fields automatically, you will have to choose which fields it belongs to. In the screenshot you can see that the field sku has been linked to the product_sku field, the field picture has been linked to file_url and so on. Do the same for your fields and click on Save & Close, this brings you back to the field map list. With your field map ready, you can now create a template by clicking on the Create template link in the Template column. This will create a new template based on your field map settings that you can then use for import. You can now use this template for an import.